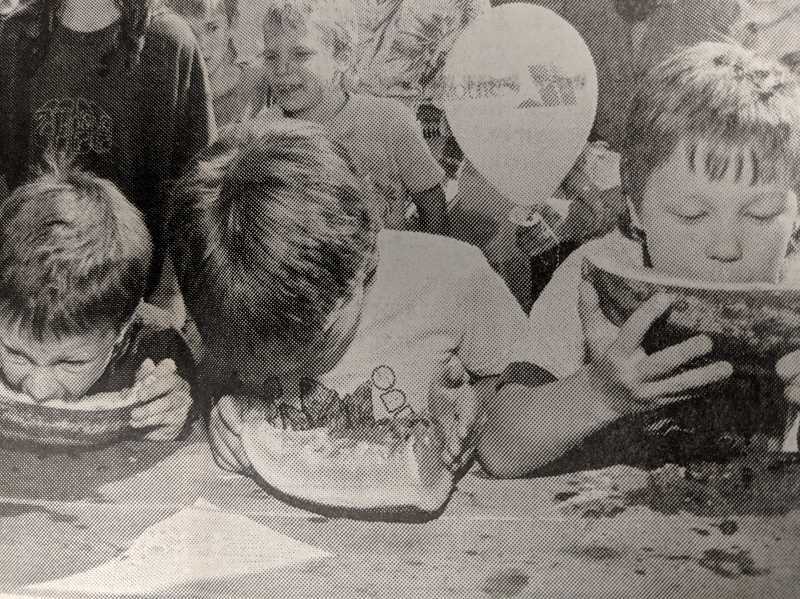 Several decades prior, children enjoyed a watermelon eating contest at the Estacada Sentry Store. The Broadway Theatre was offering a triple feature that included "Blood of the Vampire," "Night Creatures" and "Brides of Dracula." The theater was also showing "Doctor Zhivago," described as "The story of Zhivago — a man torn between his love for his wife and the passionate and tender Lara, told against the flaming background of revolution." Members of the Estacada Garden Club held their annual picnic at River Mill Park. The event had "a good turn out." The group would soon hold workshops at member Pat Gilpin's house to make 150 flowers for a larger district meeting. "Irene Adams is busy making the name tags," The News reported. Timberlake Job Corps invited community members to "a round-up of family and friends" at their campus in the Mt. Hood National Forest. There would be tours, lunch and entertainment. Children participated in a watermelon eating contest at the Estacada Sentry Store, part of a kids day promotion at the business. Darrick Driskell took first place in the competition. Subway was celebrating Marvin the Martian's birthday. During the promotion, those who purchased a children's meal would receive a toy depicting the popular cartoon. Estacada Little League participant Joshua Harkless, 8, won a radio and CD player after a raffle drawing of all the little leaguers who had sold a case of candy in a recent fundraiser. "Wow. This is good. Thanks," Harkless said when he received the prize. New educators in the Estacada School District included Michelle Lamorille, a kindergarten teacher at Clackamas River Elementary School; John Hively, a special education teacher for the district; Sarah Powers, a third grade teacher at Eagle Creek Elementary School; Aaron Raasch, a seventh grade social studies teacher at Estacada Junior High School; and Chunyan Diao, a Chinese language teacher at Estacada High School and Junior High School with the district through a Chinese Guest Teacher program organized by the Office of Chinese Language Council International. About 40 people gathered at Milo McIver State Park's equestrian meadow area to watch the total solar eclipse, and many appreciated the relaxed atmosphere in the park. Sisters Linda Lund and Mari Anne LeCut traveled to Milo McIver from Portland for the event. To mark the moment of totality, LeCut played Bonnie Tyler's song "Total Eclipse of the Heart" on her phone. "I've been waiting to play that song," she said.